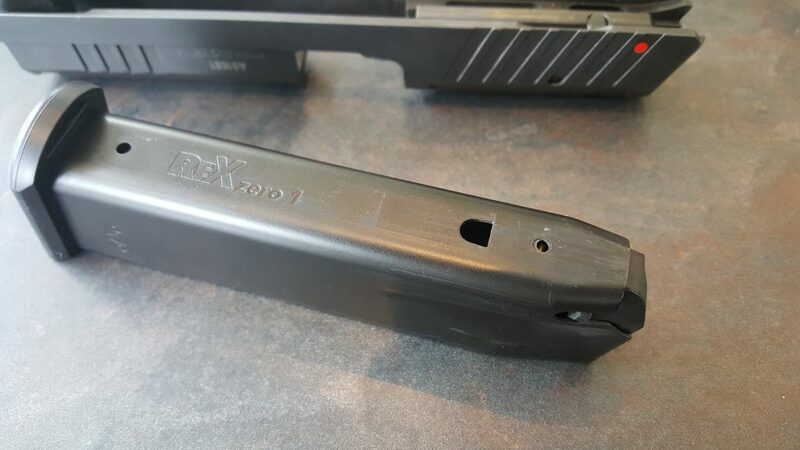 A Rep from Arex came by to show us their new REX Zero 1 pistol. 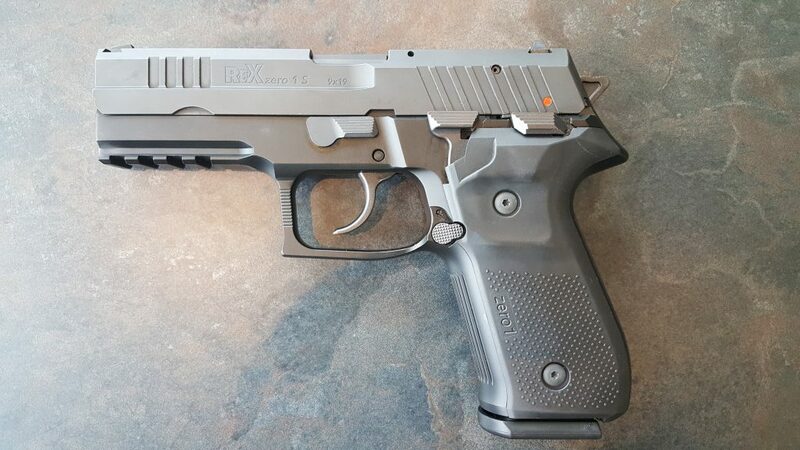 At first glance it looks like just another SIG knock off, like we’ve seen before. But there’s something different about this one, and it warrants a closer look. First thing you’ll notice is the Ambi Safety where the classic SIG slidelock lever is. So it does have a manual safety. The Magazine release is Ambi as well, and works and feels exactly the same from either side. Deliberate push but not too much effort… damn near perfect actually. 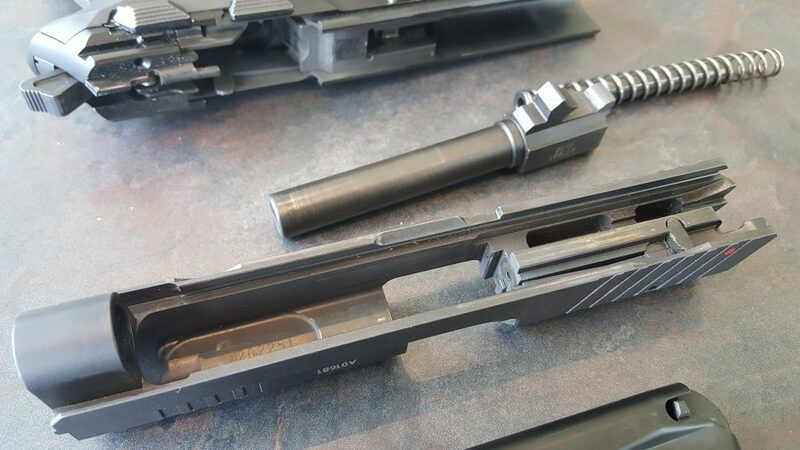 And the magazine (comes with two 17 rounders – they have no desire to sell to California or other restrictive states) drops freely and cleanly. The gun is very SIG-Like. With full length rails and much of the architecture is classic SIG. 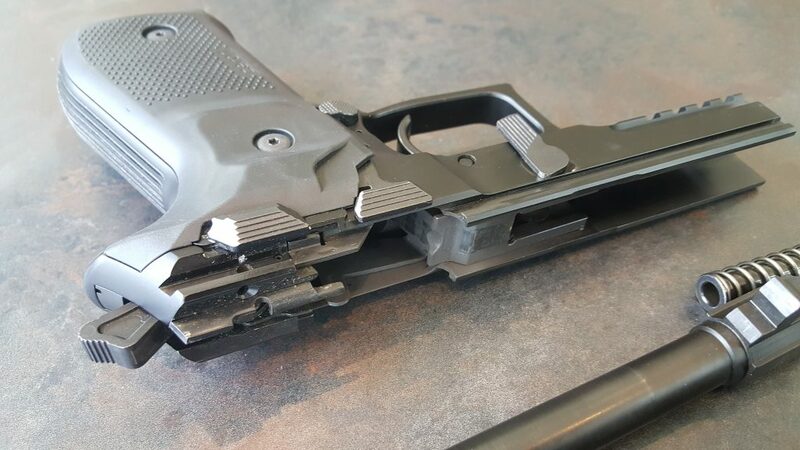 Remember when I said the Slide Lock is a Safety? Well, these guys made the Decocker the Slide Lock Lever as well as the Decocker. So it works like a SIG, and it works like every other gun on the planet, all in one Lever. It’s really very clever. Kudos to the engineer on that. What surprised me is the nation of origin. Slovenia. Slovenia is a nice little country surrounded by Croatia, Italy, Austria, and Hungary…. a region that is very beautiful, but not know for Technical Exports into the USA, but evidently they do well exporting to the rest of Europe especially in the more technical aspects of the automotive industry… So they do have the technical chops. Miss Slovenia kinda looks like a Discount Kristen Stewart. But I wont hold that against them. The gun breaks down just like SIG, the Barrels look like they could be interchangeable as well. The internal machining is very clean, like a SIG. The only real departure is the normal coiled spring instead of the multiple coils. The Magazine locks at the front-center which makes it naturally Ambi. The Mags look to be very well made, smooth, and seem to be of high quality. The test example had very even wear marks, with the wear only finish deep… very normal looking. And all the parts, fitment, and finish seem to be of very high quality. Typical SIG take down. No surprises, no warts found. It’s an impressive gun. I did put some rounds through it… and it functioned reliably. The trigger was smooth, no grit, no stacking… it was very SIG-like. But it was a bit heavier than my SIG P220’s trigger. Not much, but I noticed it. This did not hamper the gun’s accuracy. It shot VERY accurately. I’m not going to show the target, because after I shot it, other shooters followed on the same target. But trust me – the accuracy was very good. 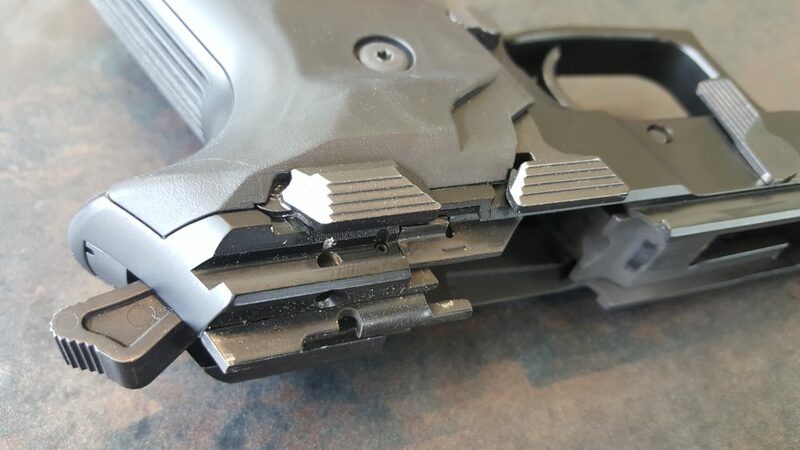 The only downside to the pistol that I found was that the dovetails looked strange… and when I asked the Rep, he informed me that they are proprietary and nothing on the After Market will fit. (Same with the Grips) He then told me that they are working on other Sight options for the gun. The standard 3-Dot sights are fine for most shooters… but Defensive Shooters will want Tritium sights and Competitors will want Fiber Optics. I did not ask how easy it would be for a Gunsmith to cut the dovetails to fit a more common type… but I imagine it could be done rather easily. Talking pricing, this is where it’s Un-SIG-Like. You’ll be able to find these retailing anywhere from 200 to 400 dollars less than a SIG 226. And that makes this gun a very viable option – but remember this was just my initial impressions from a brief (But careful) examination and a brief range session…. I would love to test one through a 2,000 trial. My take away is that if I want a Discount SIG, I’d find a good used SIG and buy that, instead of this one that has different sights and different magazines and will need different holsters, I’m sure. 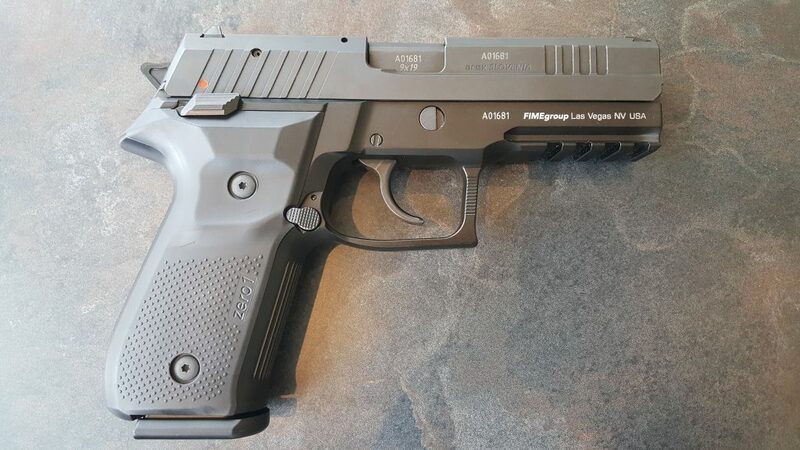 But if I wanted a brand new gun that is unique and operates more like a normal gun but still has that SIG look and feel… well… this is that gun. It has a lot going for it and buyers will most likely be very pleased with the purchase. 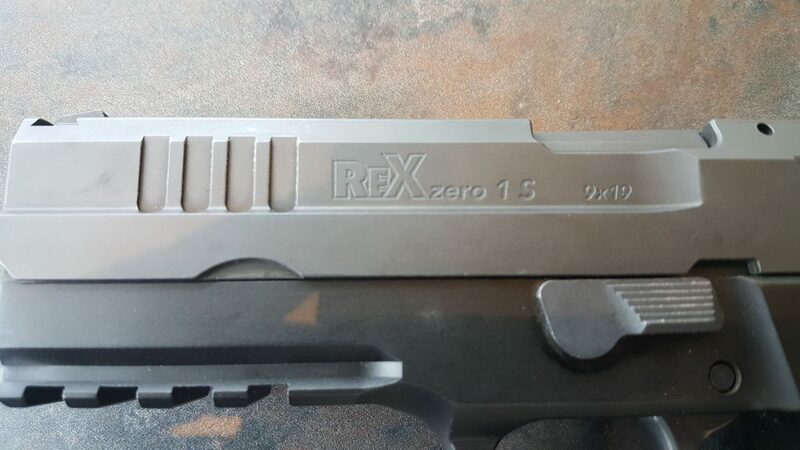 For more Information on the REX Zero 1, check out the factory website.